Uniden BearCat BCT15X scanners are loaded with features that RF fans can make use of quickly, easily, and with extreme efficiency. This is NOT a digital scanner. Uniden BearCat BCT15X mobile base scanners come pre-programmed with many of the channels in use by local police, department of transportation, and highway patrols for easy state-by-state scanning. Uniden's TrunkTracker III technology allows you to keep up with all the action on the most popular trunking systems including Motorola, EDACS and EF Johnson (LTR systems. The BCT15X automatic scanning feature will instantly find the active Talk Groups in your local area. BearTracker warning system alerts you to police activity, this can be helpful in avoiding an area while driving. News services take advantage of BearTracker to be able to get in only the action while it unfolds. Fire tone out, CTCSS, and SAME weather ensure that you are in touch with the activity that is most important to you, locally. Uniden Close call RF Capture Technology allows for the detection, display of frequency, and listening to the nearby strong radio transmissions while actively scanning across all available channels. Be alerted to nearby emergencies, news, and other activities while scanning across remote bands. Close Call is especially useful while driving in cities or towns and wanting to avoid active fire and EMS call outs. Step by step installation instructions are included in the BCT15X user's manual. The BearCat scanner Fire Tone Out is an often relied upon feature of the BC15X, enabling volunteer fire fighters to stay at the ready even when busy with their daily lives. Search and Rescue teams use the BearCat BC15X to get an early start on rescue planning and training operations, ensuring the safety of county residents and visitors during all seasons. The BearCat BC15X monitors a wide array of frequencies including: AM, FM, UHF, CB, Amateur radio, public service, and military channels. If the frequencies or Talk Groups are active within your area and not blocked you will be able to listen to real-time updates and activities. The BCT15X scanner receives 25-512, 764-805, 806-956, and 1240-1300 MHz, excluding cellular frequencies which are guaranteed private by U.S. government regulations. GPS based scanning and alerts are available when the BCT15X is connected to an optional GPS device. The GPS-enabled feature permits the scanner to turn system reception on or off depending on the user's location. Customize your scanners display with location-based information. 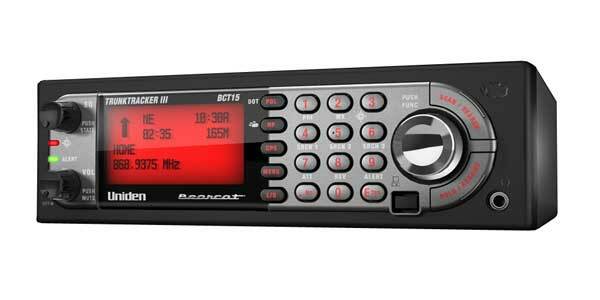 The Uniden BearCat BCT15X scanner is GPS enabled, but does not come with a GPS unit. It has 9000 dynamically allocated channels, up to 400 systems, 100 system Quick Keys (10 channel group quick keys per system). Private listening is easily accomplished with a 32Î© headset with 1/8" 3.5 mm audio connector. The ability to record received RF transmissions is accomplished by connecting an external recorder to the REC jack on the back of the BCT15X with a stereo or mono 3.5 mm audio cable. The BCT15X is an advanced mobile base Trunking scanner that will keep you in contact and prepared for any adventure. DCS/CTCSS Rapid Decode - Instantly detects and Displays the Sub audible Tone So You Can Quickly Determine the System Settings.